Monroe, MI, Oct. 3, 2014 – The new Rancho® competition radius arm suspension system for 2014 Dodge Ram 2500 4WD diesel trucks recently met all requirements of the U.S. Federal Motor Vehicle Safety Standard No. 126 – Electronic Stability Control Systems (FMVSS-126) test. 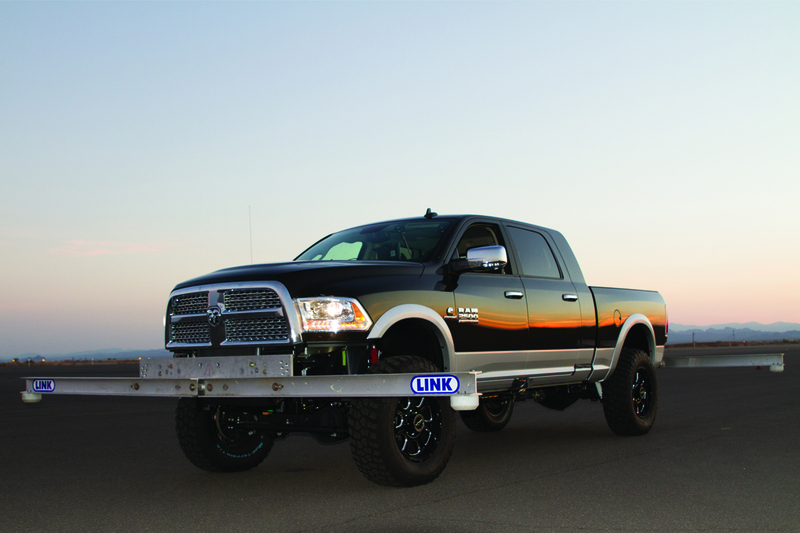 Rancho also has released a new drop bracket sport system and a “Level It” kit for the popular diesel Dodge trucks. The FMVSS-126-certified Rancho Dodge Ram competition radius arm suspension system (RS66453B) provides an additional 4.5-inches of lift and features extended length, competition-style radius arms. Each kit includes adjustment tabs to allow the re-use of factory cam bolts to meet caster specifications. This system also includes Rancho front coil springs, progressive rate rear coil springs, high-strength steel sway bar brackets and a newly designed forged pitman arm. The Rancho system was tested with 37-inch tires. Several shock series are available and compatible with the kit, including RS9000XL® shocks (RS999048 front; RS999048 rear); RS7000MT® shocks (RS7048 front; RS7048 rear); and RS5000® shocks (RS5048 front, RS5048 rear). The kit also is compatible with the Dodge Electronic Stability Control System and allows for re-use of the OE wheels and tires. The new Rancho 4.5-in. drop bracket sport system (RS66452B) – available for 2014 Dodge Ram 2500 4WD diesel single rear wheel drive trucks – fits up to 37-inch tires and was designed to help provide additional off-road durability and performance as compared to the original equipment. The kit features several Rancho-exclusive designed and fabricated components including a forged pitman arm, radius arm drop brackets, steel sway bar spacers, track bar relocation brackets. The system also includes Rancho front coil springs. Several shock series are available and compatible with the kit, including RS9000XL shocks (RS999048 front; RS999048 rear); RS7000MT shocks (RS7048 front; RS7048 rear); and RS5000 shocks (RS5048 front, RS5048 rear). This new Rancho system is compatible with the vehicle’s Electronic Stability Control System. The latest Rancho “Level It” 2.5-inch suspension kit for 2014 Dodge Ram 2500/3500 diesel single rear wheel drive trucks (RS66451R9) lifts the front of the vehicle and helps to deliver additional on- and off-road performance. The new systems accommodates up to 35-in. tires and includes popular RS9000XL front shocks. 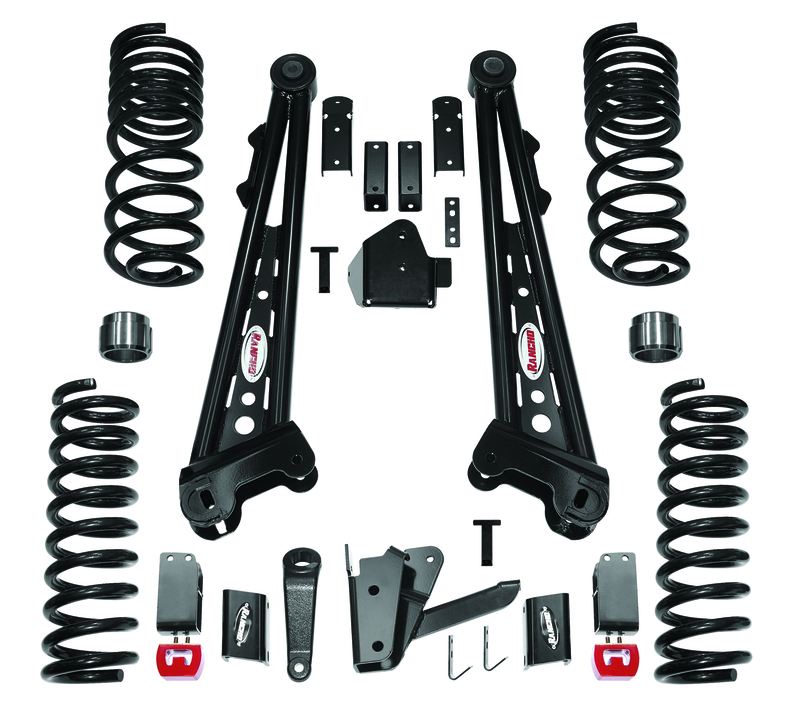 The bolt-on kit also includes coil springs and sway bar relocation brackets. The sway bar relocation brackets help to ensure optimal steering angles for roll and sway control. The system is compatible with the OE wheels and tires. To complete the Dodge “Level It” kit, Rancho offers rear RS7000MT shocks (RS999044) for additional purchase. All Rancho brackets are manufactured using high-strength, low-alloy steel. Every Rancho suspension system is designed for ease of installation and include a detailed, full-color installation guide. The new Rancho Dodge suspension systems are backed by the Rancho brand’s limited lifetime warranty, see www.GoRancho.com for detailed information about the offer. The Rancho brand is well known for leading performance suspension and shock technologies and has a history synonymous with the off-road industry. Rancho has been delivering innovations to the off-road market for nearly 60 years. Rancho products are manufactured and marketed by Tenneco.